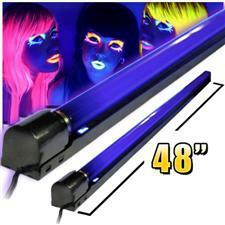 This Sleeklook 48 inch Blacklight will light up most average size rooms. This fixture's unique and sleek design, allows you to experience a full 360 degree. Four full FEET of black lighting tube! Comes in a tube fixture so you can mount it anywhere. Great for lighting up a house party. One of my friends put one under his bar at his house and it looked AMAZING!